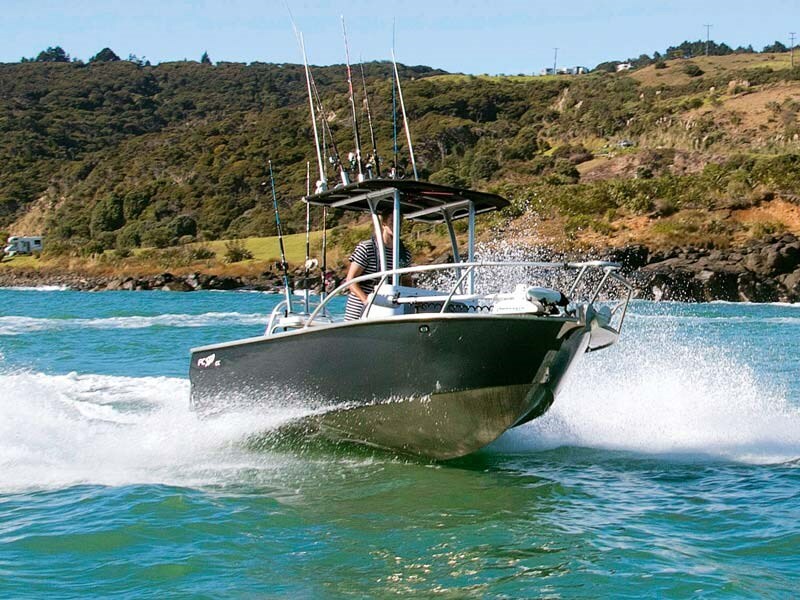 Fish City has been building boats for five years on top of two decades selling and rigging them, so it’s no surprise the FC560 Centre Console is a great boat at a sharp price. From the start, Fish City Boats built innovation into its models as standard features, and this new boat reaps the benefits. 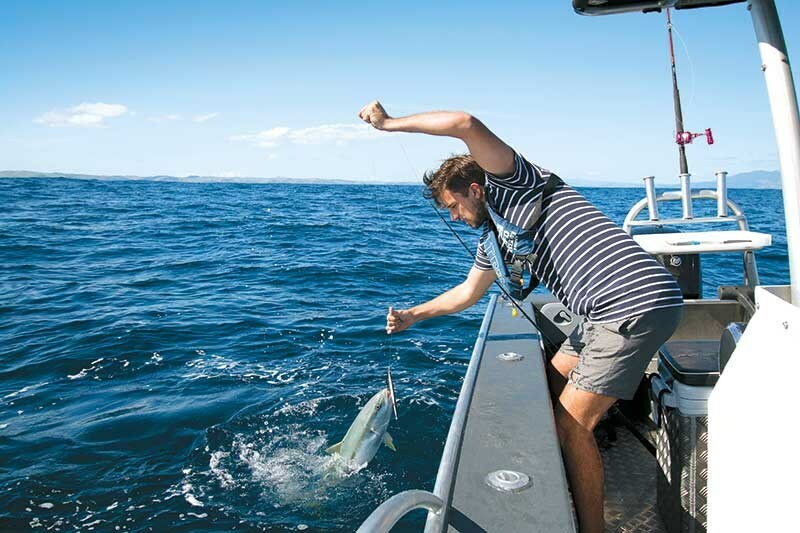 Safety and stability are prime concerns, so the 5.6m FC560 starts with the dual positive buoyancy system featuring foam-filled under-gunwale buoyancy chambers to ensure the boat is not only unsinkable but remains upright when swamped. We saw this tested on a previous model and it performed as claimed, the boat floating level and stable even completely filled with water. Next, it has Fish City’s proven auto-stabilising system. Comprising a flooding keel and holding gate, this allows the boat to settle in the water at rest to markedly reduce any rocking motion. A closing hatch in the forward half of the keel means the ballast effect can be retained underway. Importantly, this is in the front of the boat to overcome bow-lift, especially important when the boat is lightly loaded as it helps the boat punch through waves. When not required the ballast can be emptied completely. The third standard safety feature is the dry-riding gunwale system. How is an overhanging gunwale around the sides and bow safety related? Reducing the spray hitting the skipper in the face not only makes a huge difference to their comfort but also ensure their view is unimpeded, which is especially important in open boats such as this centre console as well as smaller tiller-steer models. 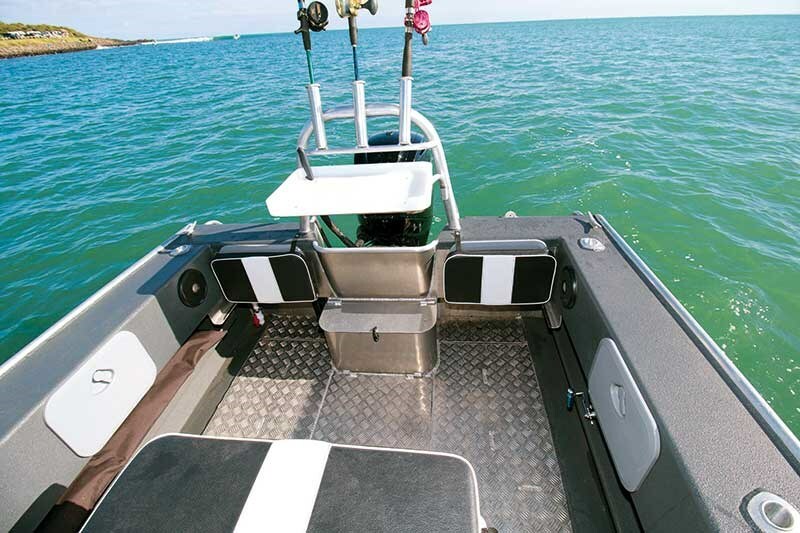 This new model FC560 is configured with a centre console broad enough to provide shelter for two yet leaving sufficient space to walk around the entire boat. Seating is on a sizeable padded chilly bin that slots into a central pod and can be removed to clean. There’s no windscreen as standard but the console provides adequate protection from the wind when you’re seated and an optional clear screen and side panels can be clipped to the uprights for more shelter if required. 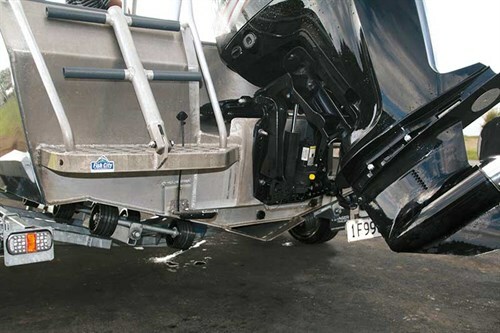 The review boat had the fixed T-top attached to the console but a folding option is available that allows the boat on its trailer to fit under a standard-height garage door. The unit hinges forward to ensure it can’t blow over when travelling at speed. 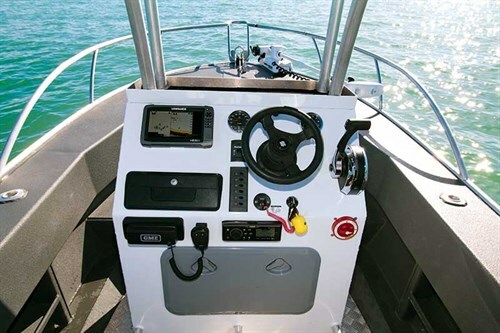 The console has a broad dash area and the review boat had the latest Lowrance HDS9 Gen 3 touchscreen display fitted. Combined with the Lowrance Structure Scan side-scanning sonar, this gave us a fantastic view of the seabed below and to the sides of the boat, enabling us to search find fish before deploying the Minn Kota trolling motor to hold us over the exact spot. Mercury Smartcraft gauges, a GME VHF radio, Fusion stereo and controls for the Maxwell windlass complete the helm electronics. A locking glove compartment is handy for keeping mobiles and paperwork out of the elements, although a flat carpet area on top of the console, with a lip to prevent items slipping off, also proved secure. The entire interior and the gunwales have been coated with Speedliner, a polymer-based non-slip coating usually applied to ute trays. This provides an extremely tough protective layer and reduces glare from the aluminium. It provides a secure footing even when wet if you’re wearing shoes was somewhat less effective for bare feet when wet. A number of hatches provide wet and dry storage areas, with the main hatch behind the helm big enough to swallow two dive cylinders. A self-filling livebait tank under the transom, with a hinged splash cover, is great for keeping livies going and with the bung removed it drains rapidly. Along either side of the transom are folding seats with comfortable padded squabs. A modest step on the outside provides access for swimmers, with a T-style boarding ladder on the port side for divers. 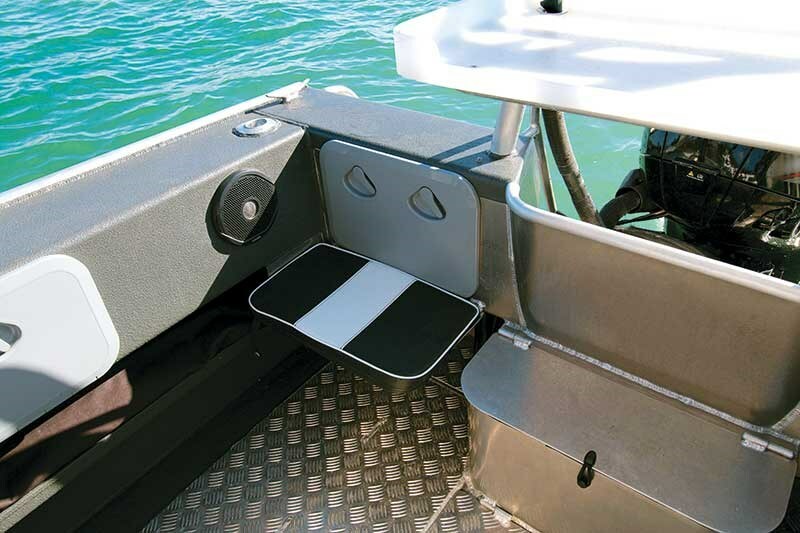 A removable bait board fits into an arch that provides a ski tow point, three rod holders and protects the outboard. Hanging off the back of the test boat is the new Mercury 115hp four-stroke. Introduced in 2014, this inline four-cylinder has one of the largest displacements of any 115hp four-stroke outboard yet it’s lighter than any competitor. The big capacity means the engine isn’t working so hard while providing greater torque and hence better holeshot performance. Mercury claims it’s quieter and smoother than its rivals and we certainly noticed the motor’s noise – or rather the lack of it. At idle we genuinely had to check the gauges to make sure the engine was running on occasion, while at cruise speed we were able to converse normally and even at wide-open throttle we could talk rather than shout. The multi-point electronic fuel injection optimises fuel consumption throughout the throttle range and we noted the most efficient planning speed was almost midway through the rev range, 3500rpm delivering a comfortable 17 knots. Achieving 1.3nm/L (0.77L/nm), this gave the boat a range of more than 140nm or eight hours’ continuous running, opening up extremely long trips well beyond the reach of most similar centre consoles. The acceleration meant we needed to hold on tight when flooring the throttle and we reached almost 34kt (40mph) with two occupants and a full tank of fuel, well above the speed you’d normally operate a boat this size. 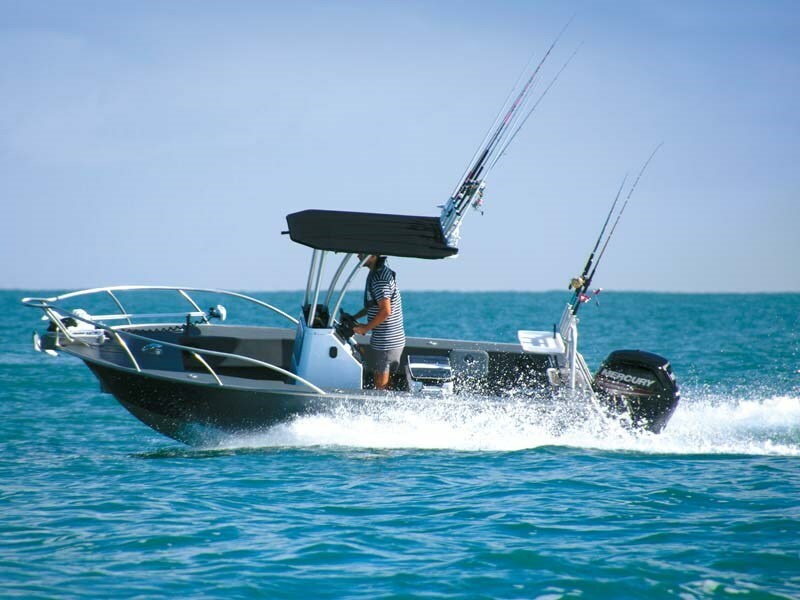 The hull is rated for 90 to 115hp, and based on the performance from the Mercury 115hp four-stroke, a 90hp motor would undoubtedly be adequate. However, extra power would be useful if you intend to load the boat up to its capacity – six people and their gear. The dry-riding gunwale system proved equal to its name, with absolutely no spray coming up the sides of the boat. In almost all conditions experienced on the day (Wind 10-15kt, slight chop) we felt absolutely no spray despite not having the optional clears fitted. Obviously an open boat will get wet in rough conditions but the overhanging coamings do a great job at reducing spray. At rest the ballast system comes into play, allowing the boat to settle and stabilise. We were regularly both on the same side of the boat with no issues or uncomfortable lean, yet once the power is applied the ballast empties away in seconds and the boat quickly rises onto the plane. We first headed into the chop with the forward ballast tank empty, then with it filled. While the boat performed well both times, the difference was obvious. With just two of us on board and the weight all in the rear, the extra weight up front helped the boat cut cleanly through the smaller chop, resulting in a smoother and quieter ride. Naturally, with more people or gear on board there will be less benefit from the ballast. 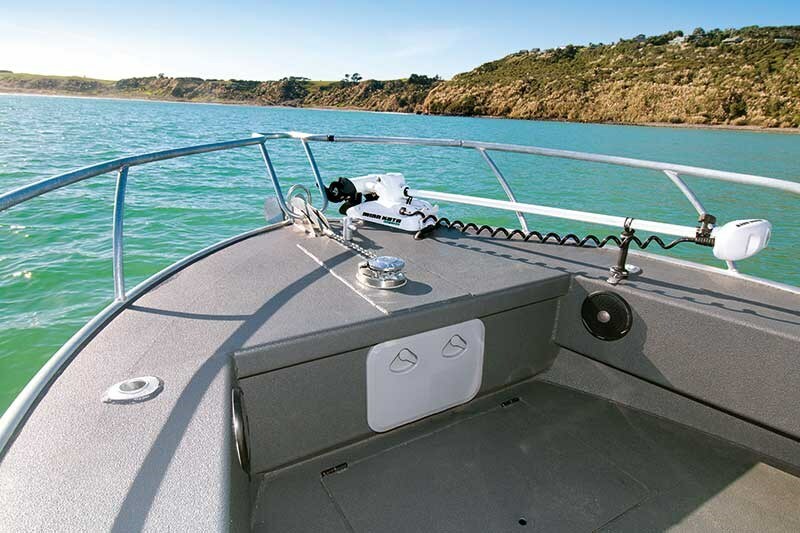 Given the range, stability, protection and safety packed into this 5.6m centre console, not to mention the keen pricing, we’d expect the FC560 to become a familiar sight on the water.